Note: Since this blog post, Chefs Massimiliano Blasone and Marco Calenzo have both left Cassis Bistro. You may recall that I went to Apsleys last year, an Italian one star Michelin restaurant in the Lanesborough Hotel on Hyde Park Corner. Executive and sous chefs Massimiliano Blasone and Marco Calenzo have since left Apsleys and now head up the kitchen at Cassis Bistro in South Kensington, therefore adding a star quality to the existing bistro menu. 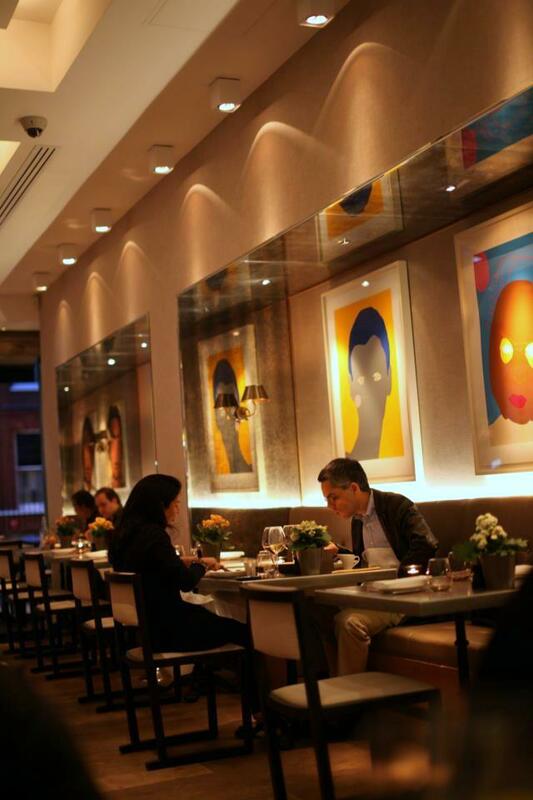 The restaurant is lovely, exuding a feeling of comfort and warmth with the use of earthy tones. There are also some high-end pieces of art on show, including original pieces by Matisse. Cassis is part of the Marlon Abela Restaurant Corporation (MARC) which also owns a number of Michelin restaurants in both the UK and the US, including The Greenhouse and Umu, and the starred Italian A Voce in New York City. With Massimiliano and Marco on board, the idea is to launch an A Voce restaurant here in London sometime next year with the hope of it obtaining a star. Cassis is therefore the springboard for that project. I recently dined at Cassis at the invitation of the restaurant. My meal was a specially created tasting menu that included some of the dishes from the à la carte menu. Davide Buongiorno, previously the Head Sommelier at Apsleys, has also made the move to Cassis and he expertly paired wines for us to go with our meal. 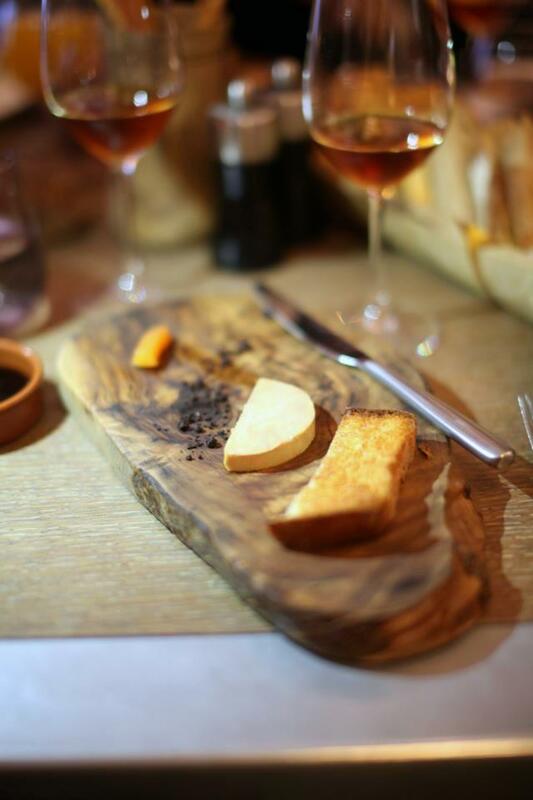 To start, foie gras marinated in a Provencal wine was served with slow cooked peach, brioche and “terra” crumble made with cocoa and butter (wine: 2008 Passito di Pantelleria, Sangue d’oro, Carole Bouquet). The foie gras was deliciously rich, the brioche was lovely and the crumble added a textural crunch. Caramelised foie gras topped with a lovely sugary coating produced an affect similar to crème brûlée and was divinely tasty. 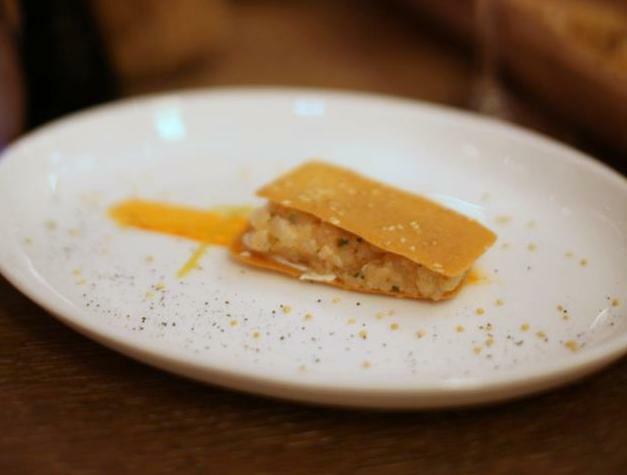 Seabass tartare with a sesame wafer was fresh and precise (wine: 2010 Albariňo Viňa, Ventureira). The wafer was magically thin and crispy and showed off incredible skill in its preparation. The delicate nutty flavour of the sesame seeds added a gentle flourish. For garnish, there was some lemon candy and carrot reduction. A wonderfully light langoustine roll merged favourably with a finely crafted parsley purée. Also on the plate were red basil and some thin and crispy deep fried red potatoes that left a scrumptious aftertaste. 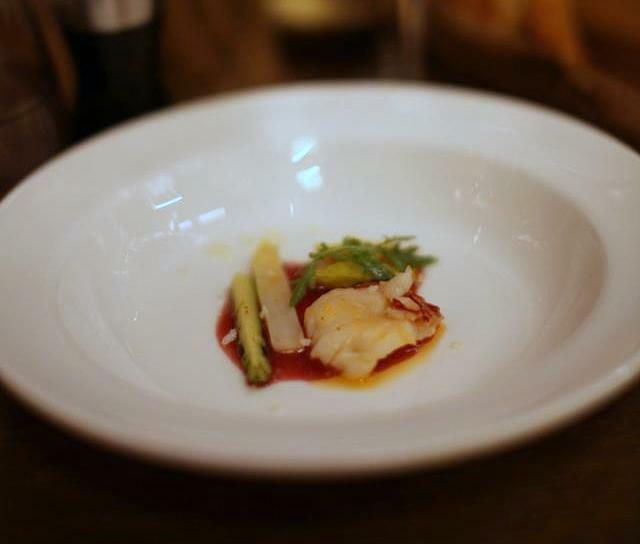 A dish of sweet lobster medallion served with white and green asparagus and rocket was light as a feather. The vegetables were fresh and intensely flavoursome. 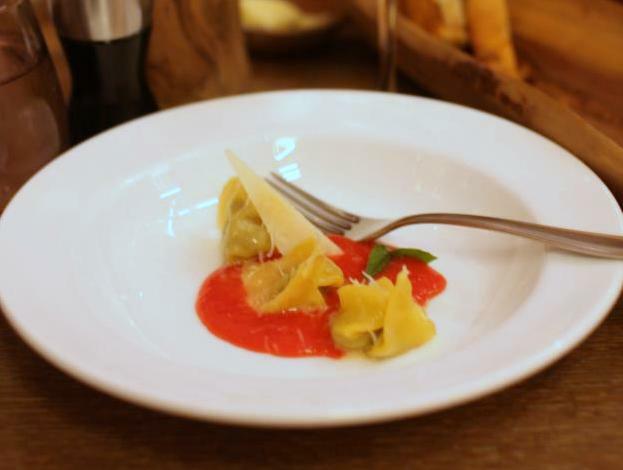 Aubergine tortelli came with a basil tomato cream. The pasta was cooked al dente, and the latter gave way to an intensely tomato flavour. 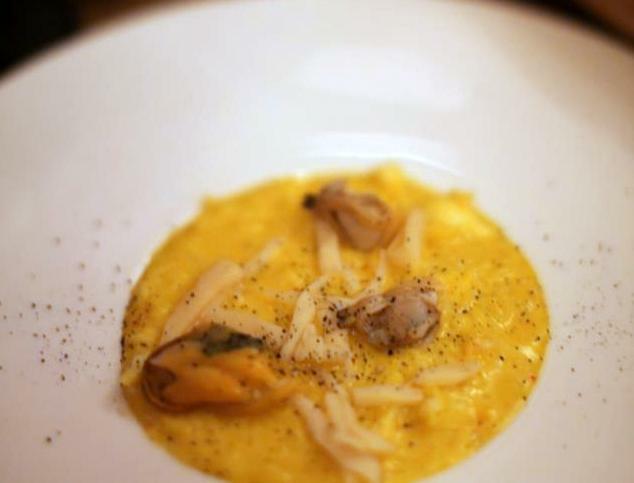 Risotto made with acquarello rice, saffron, orange zest and shellfish was creamy and sweet from being cooked with a beautiful fish stock (wine: 2009 Côteaux Varois en Provence, Château la Calisse). 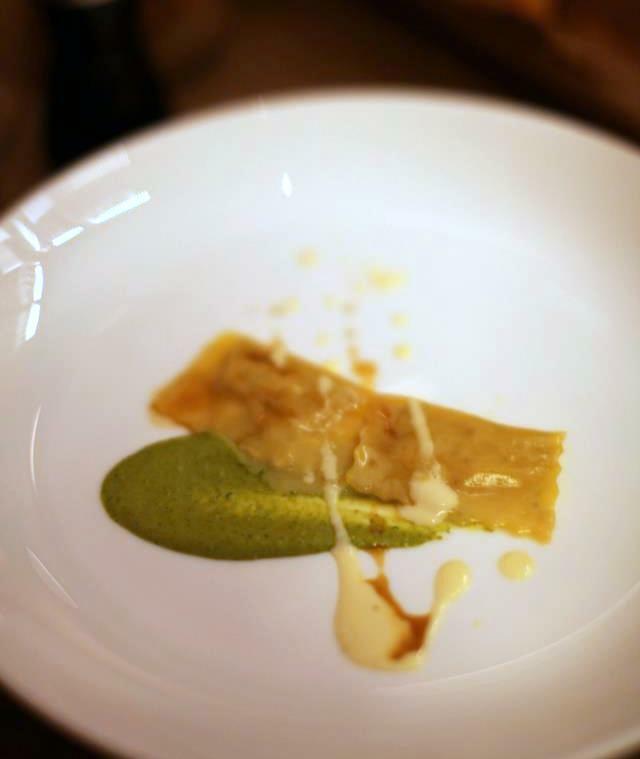 Rabbit ravioli with a pistachio sauce made from the highly prized Bronte pistachios from Sicily was divine (wine: 2000 Savennières, Cuvée Bel Ouvrage, Domaine Laureau). The pasta was wonderful, the rabbit was rich with flavour and the sauce was appealingly light. And for added flavour, there was a drizzling of intensely reduced veal jus to round of this delightful dish. 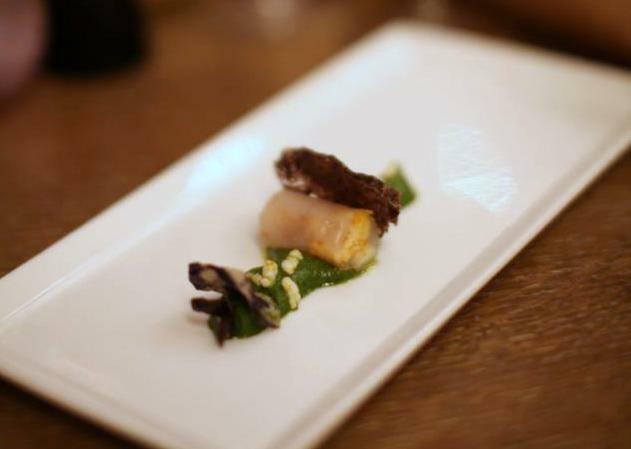 Scallop with fresh pea purée and girole mushrooms was cooked with refinement. 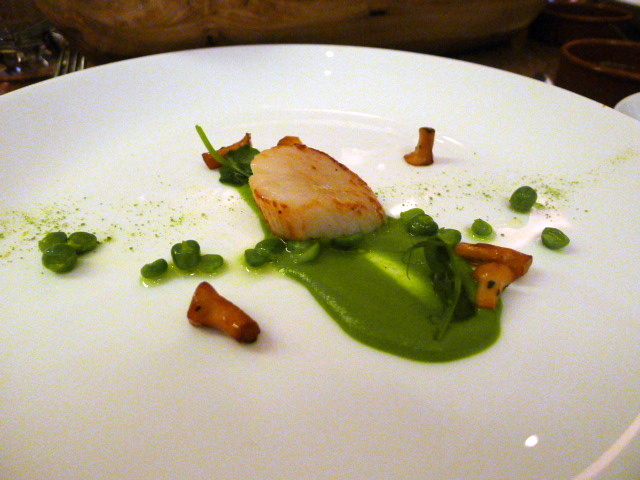 The scallop proved to be sweet, and for added contrast there were some fresh, crunchy peas (wine: 2008 Saint-Aubin, La Princée, Hubert Lamy). Halibut coated with a pata negra powder was beautifully cooked (wine: 2010 Viognier, Le Pied de Samson, Georges Vernay). The very fine powder added sparkle to the fish as well as seasoning. 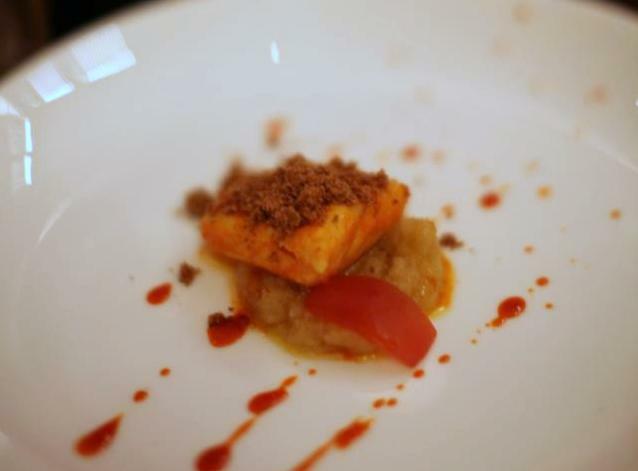 The fish was accompanied by some lovely sweet tomato confit and onion confit. 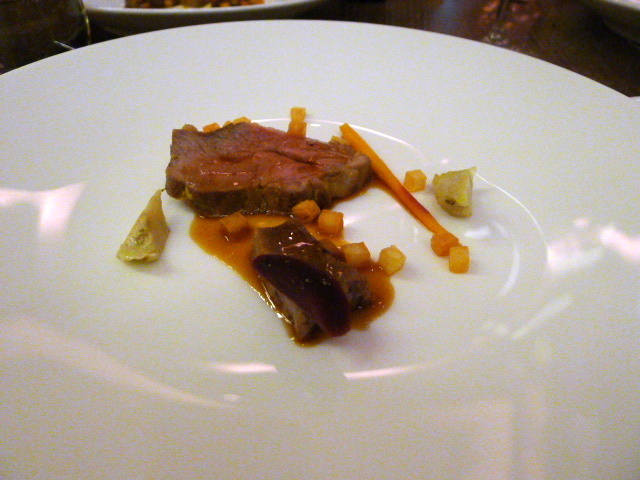 Gamey lamb with veal tongue, carrots and artichoke was beautifully cooked (wine: 2010 Toscana Rosso, Tua rita). There was great precision in the way in which the vegetables had been cut differently and cooked to the same doneness. 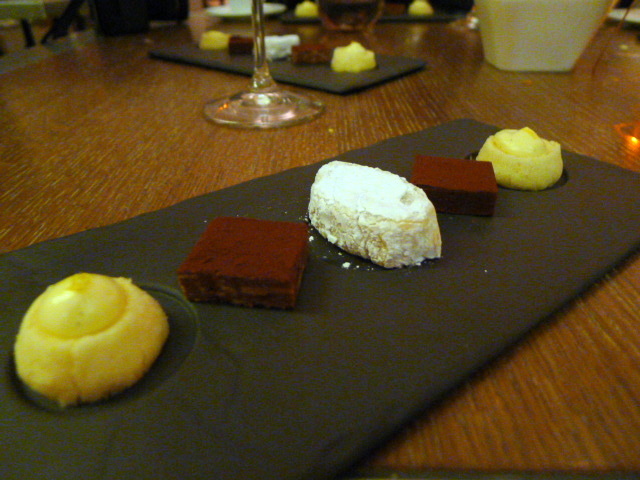 The pre-dessert was a milk variation (wine: 2010 Muscat de Cap Corse, Dom. Leccia). A crunchy biscuit base was layered with a milk chocolate mousse and a doce de leite parfait and topped with a milk ice cream. To finish were some wondrously light coconut tuilles and milk parfait. This was a glorious mesh of flavours and was excitingly complex. Chef Massimiliano created four different desserts for us to try which was a visual spectacle. 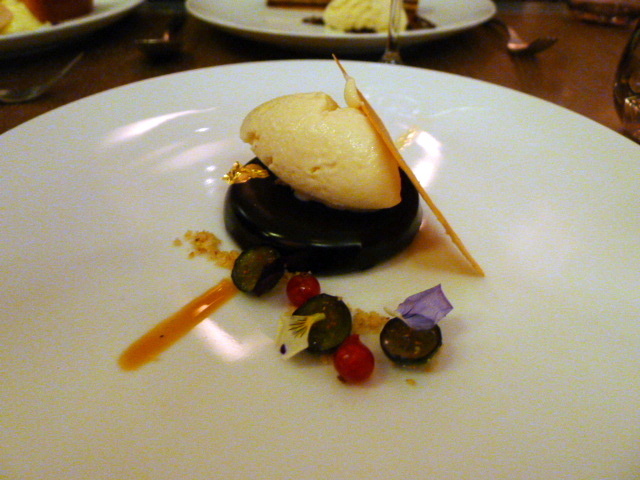 Chuao Amadei chocolate ganache with salted pine nut ice cream was gloriously decadent and intensely chocolaty. The tiramisu of the house was moulded from the lightest of mascarpone mousses and lifted by a delightful caffe latte ice cream and a coating of amaretto biscuit powder. This was subtle and refined. 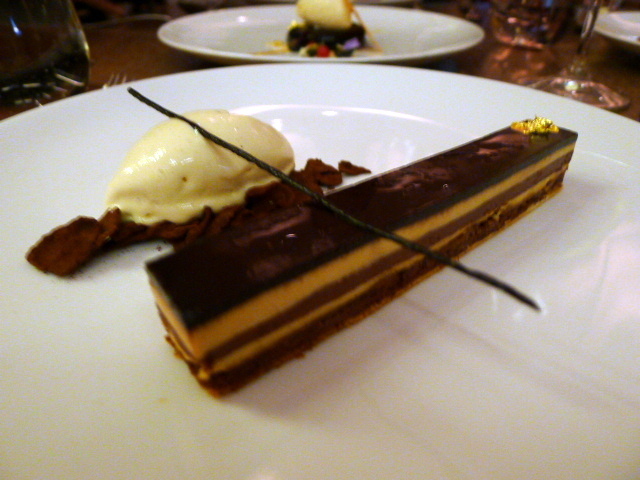 Setteveli with hazelnut bavarese, a dark chocolate mousse, praline and vanilla ice cream was expertly made with layers of textural contrasts. It was decadent and scrumptious. 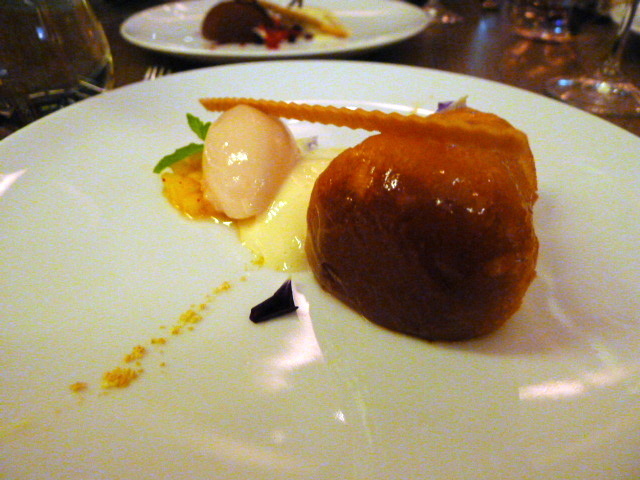 Less successful was the lemon baba (a variation of the rum baba) for its high alcoholic content. Made with limoncello, this came with a champagne foam, and peach sorbet. 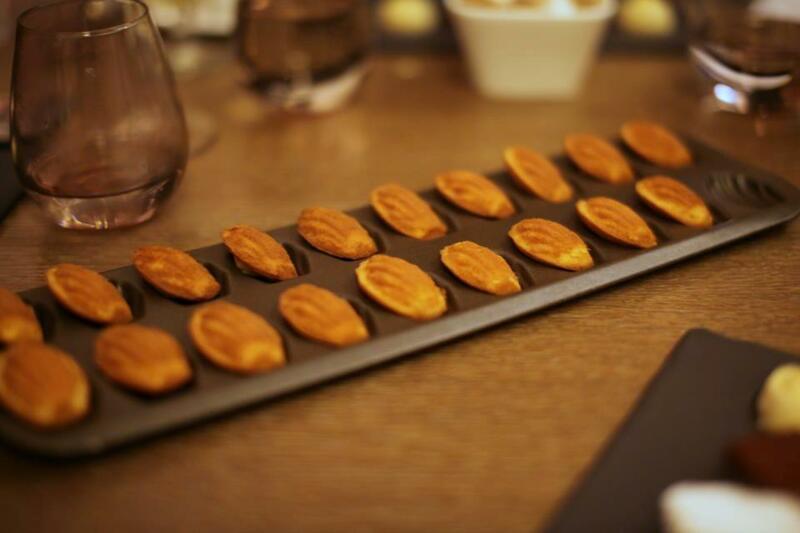 The delicious petit four selection included ricciarello biscuits made with Sicilian Noto almonds, darjeeling milk chocolate ganache, biscuits with lime curd, Gianduiotto with flaked hazelnuts and madeleines. Even with the addition of this Michelin talent at Cassis, prices have remained constant. In addition to the à la carte choices, there are also two tasting menus on offer, a five-course for £50 and a 7-course for £65. The cooking replicated the quality at Apsleys – controlled, measured, precise and flawlessly executed. 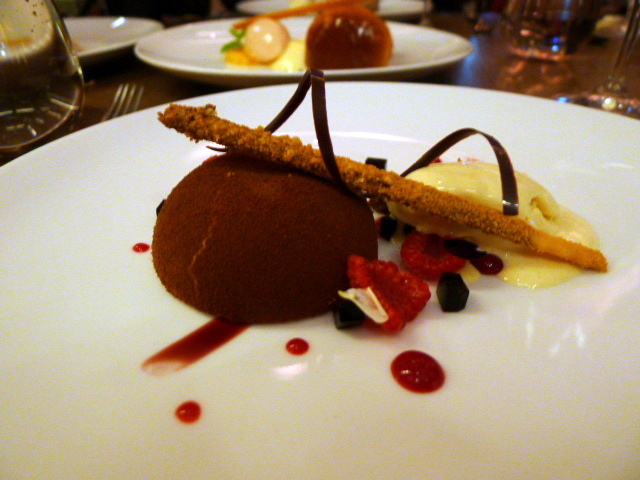 With a Michelin ambition and reasonable prices it surely is a good time to try Cassis. Price range: About £32 – £58 per head. 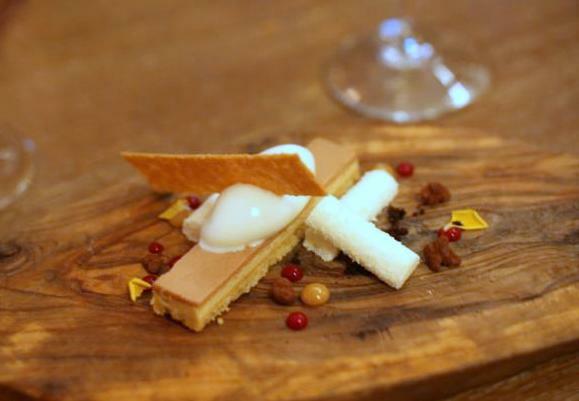 Tasting menus: five courses – £50, seven courses – £6. Excludes drinks and service. Wow those are pretty luxe ingredients – foie gras and lobster – makes it worth the price tag I think. Yes we had quite a luxurious meal! 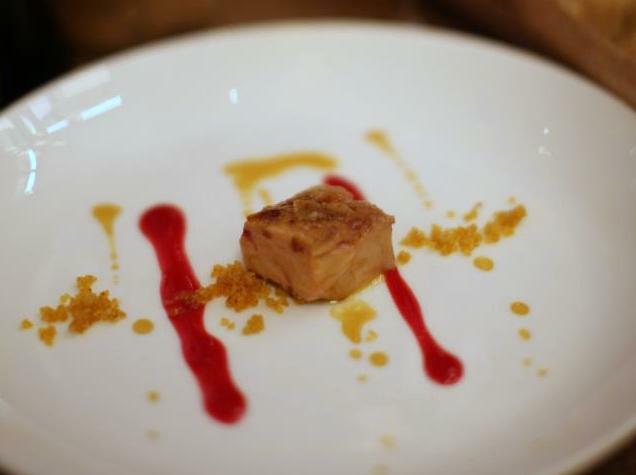 Loved the foie gras.